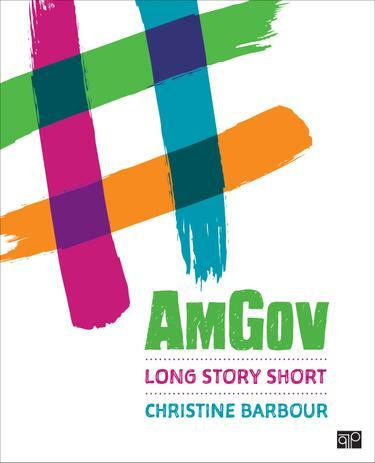 A truly revolutionary American Government textbook, Christine Barbour and rsquo;s AmGov: Long Story Short, responds to the needs of today’s students and instructors through brevity and accessibility. The succinct ten chapters are separated by tabs that make it easy to skim, flip, revisit, reorient, and return to content quickly. Reading aids like bullets, annotations and arrows walk students through important facts and break up the material in short, engaging bites of information that highlight not only what is important but why it’s important. Though brief, this core book is still robust enough to provide everything that students need to be successful in their American Government course. Whether for the on-the-go student who doesn’t have time to read and digest a lengthy chapter, or the instructor who wants a book that will stay out of their way and leave room for plenty of supplementary reading and activities, AmGov provides a perfectly simplified foundation for a successful American Government course.